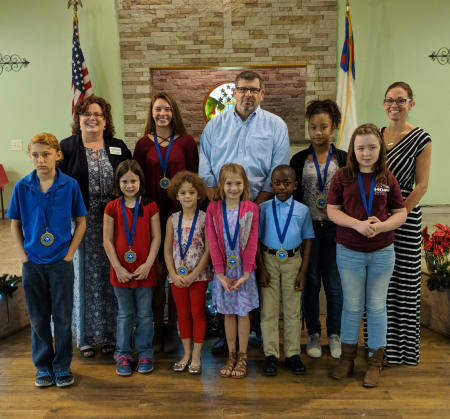 Ten students from area schools are recognized every month during the school year at our Student Citizen of the Month ceremony. Students honored by the Zephyrhills Chamber’s Citizen of the Month program are chosen by the teachers and administration of their individual schools for exemplary effort, achievement and contribution to their school, family and community The Zephyrhills chamber has recognized students with this program each month of the school year for more than 20 years. At the monthly breakfast ceremony, Student Citizens are presented with certificates of achievement, medallions, and letters of commendation from local and state officials recognizing their achievements and the exceptional example they set for their peers. Students and their families are treated to breakfast and the students are awarded with various gifts and recognitions from businesses who sponsor or support the program.Our student citizens are always thrilled to leave with a bag full of “goodies” provided by chamber supporters. During the ceremony, the students are brought on stage individually for a brief interview and parents and teachers are invited to give words of encouragement for each student. Thank you for investing in the future of our children & community through this long-standing community tradition. Become a “Gold Star” Sponsor: For $50 per month ($450 per year). You are invited to attend each ceremony and will be recognized at this ceremony as the Student Citizen Gold Star Sponsor in the program and in chamber newsletter. Monetary donations support the monthly ceremony, and the chamber scholarship fund. Become a “Supporter”: Trendy school supplies, movie passes, event tickets, books, or a gift certificate from your or your fellow chamber members’ restaurant or retail outlet. These are just a few examples of ways you can be a Supporter. You are invited to attend each ceremony and are mentioned in the program and in chamber newsletter as a Student Citizen Supporter. *Each month, ten children will be honored at the Breakfast. It would be desirable to have your commitment for all 10 ceremonies: a total of 90 children. This is an opportunity to tie your business to this long-standing community tradition sponsored by your Chamber. If you are interested, please contact us at (813) 782-1913 or Membership@ZephyrhillsChamber.org. Thank you so much for considering this opportunity to support this encouraging and rewarding program.